Investigators outside the building Sunday morning. 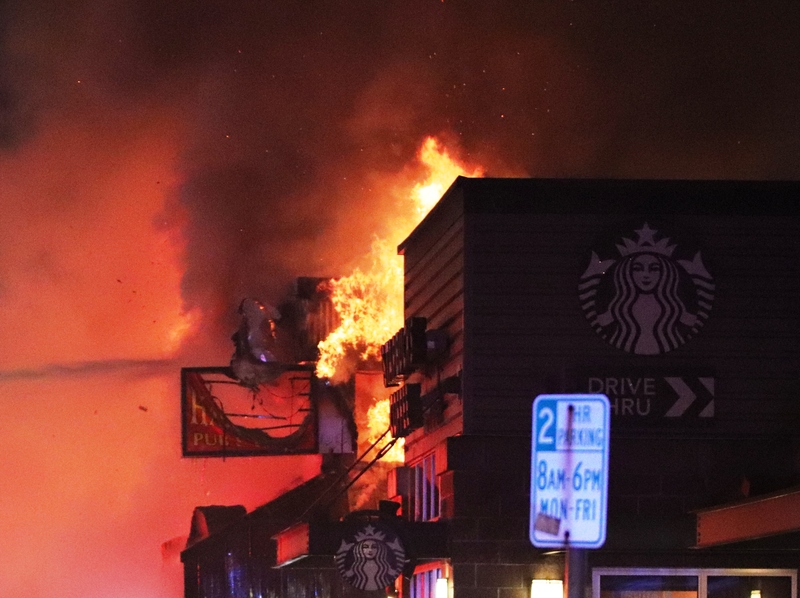 A crew member from Starbucks next door to the fire scene delivers coffee to firefighters who have been on scene all night for fire watch. The fire did not damage any of the other buildings in the block. Engine 1 and Ladder 1 pour water onto the fire. The crew from Ladder 1 uses a thermal imaging camera to check for hot spots. There was heavy fire damage on the second floor and water damage on the first floor. Firefighters responded to 3615 Broadway just after 12:30 a.m. on Sunday, Jan. 20 for a report of flames and smoke showing from the roof of Harvey’s Pub. 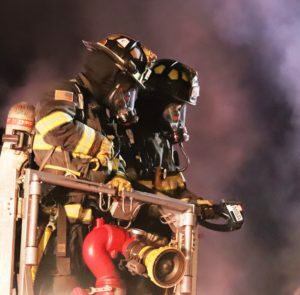 Arriving units found the second story of the two-story structure fully involved in flames and called for a second alarm. The structure consisted of a commercial business on the first level and apartments on the second level of the building. The building was equipped with fire alarms which alerted occupants of the fire who self-evacuated from the building. There were no fire sprinklers in the building. 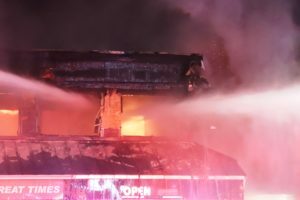 As firefighters defensively fought the fire, they received a report that one person may still be inside the structure. A search for the person was conducted on the first and second floor with nobody located, however, firefighters were not able to access one portion of the second floor of the building due to unsafe fire conditions. Once fire conditions were under control, a second search of the building was conducted, and a deceased male was found. During active fire operations, Broadway was closed but is now open. A combined team of Everett Fire Investigators and Everett Police detectives are on scene for the investigation. 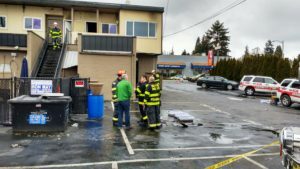 Once the investigation on scene is concluded, the Snohomish County Medical Examiner will assume jurisdiction over the body. Identification of the male will be released by the Snohomish County Medical Examiner pending positive identification and notification of the next of kin. 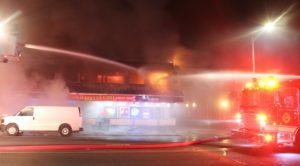 The second story of the building suffered extensive fire damage and the ground level has extensive water damage. Snohomish County PUD and Puget Sound Energy were on scene to secure the utilities to the structure. 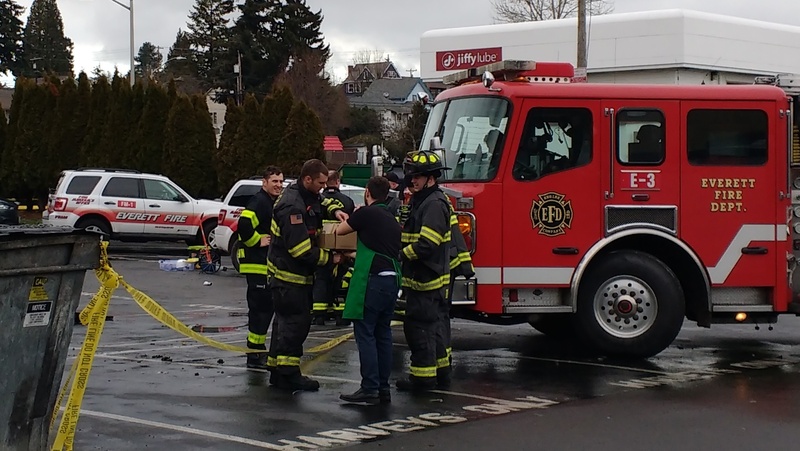 Our mutual aid partners consisted of Marysville Fire, Lake Stevens Fire, Naval Station Everett, and South Snohomish County Fire and Rescue. The origin and cause of the fire is under investigation. Updates related to this fire will be released as they become available.